I am a believer that you should design your own template. It makes your presentation unique and shows an extra level of effort and commitment. I wrote a post very recently on how you can do that. However, when Eric Vadeboncoeur asked me to review his website www.TemplatesWise.com I gladly accepted. Not everyone has an interest in designing and for these presenters there are wonderful resources on the web which offer pre-designed templates. 2. Business card & website templates. Music loops are tracks which are small in duration but can play continuously in your presentation in loops. These can be used for presentations and also for making videos. They are available for free on the website. You have the option of hearing them before download. The strange part however is that there are only 12 tracks available for download. 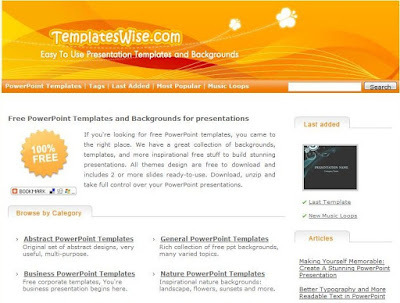 The templates get downloaded as .ppt along with the images (.jpeg). Most of the templates have not been made in master slide, which I found to be slightly weird. However for the users that should not be a concern. Thx for this website ressources! Also nice site, keep it up ! Thanks Jenny for sharing these links with all of us.